Knacksteem is an open source platform on the Steem blockchain that seeks to reward talents on a much broader scale, which eradicates partiality, and infuses transparency, on the blockchain. The initial goal of Steemit, which was to reward quality content was defeated in the sense that, creators of absolutely great content weren't recognized, and really cool talents were ignored. This major problem was the bane that stirred up the idea, creation, and finally, the development of Knacksteem. Talents and skills would never go unrecognized and unrewarded. The organization of Knacksteem makes this possible. We are using Digital Ocean Spaces for Uploading the Images. We are DO Spaces API, which provides RESTful XML API for programmatically managing the data. 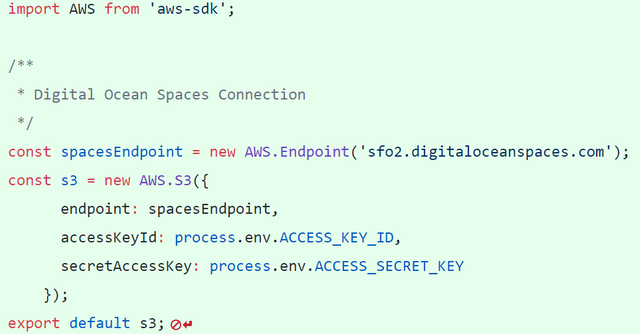 The API is inter-operable with Amazon's AWS S3 API that means it allows you to interact with the service while using the tools you already know. One of the Issues which we were facing is that whenever there was @ we were adding the "knacksteem.org/" in front of it, now if there was a Steemit Link then it is just tampering the whole link. To fix this I have changed the Regex to get only @ which has a space in front of it. Though its not a full proof fix but it will not tamper the links as of now. Fine post about fixing a few bugs with code samples. Good separation of concerns with commits.